(AP) SAN DIEGO - An increase in plastic debris floating in a zone between Hawaii and California is changing the environment of at least one marine insect, scientists reported. Over the past four decades, the amount of broken-down plastic has grown significantly in a region dubbed the "Great Pacific Garbage Patch." Most of the plastic pieces are the size of a fingernail. During a seagoing expedition, researchers from the Scripps Institution of Oceanography found that a marine insect that skims the ocean surface is laying its eggs on top of plastic bits instead of natural flotsam like wood and seashells. Though plastic debris is giving the insects places to lay eggs, scientists are concerned about the manmade material establishing a role in their habitat. "This is something that shouldn't be in the ocean and it's changing this small aspect of the ocean ecology," said Scripps graduate student Miriam Goldstein. The finding will be published online Wednesday in Biology Letters, a journal of Britain's Royal Society. Goldstein led a group of researchers who traveled 1,000 miles off the California coast in August 2009 to document the impacts of the garbage on sea life. For three weeks, they collected marine specimens and water samples at varying depths, and deployed mesh nets to capture plastic particles. The team previously found that nearly 10 percent of fish studied during the trip had ingested plastic. The voyage was partly sponsored by the University of California and National Science Foundation. Thousands of tons of plastic waste enter the oceans every year and break down into smaller pieces over time. 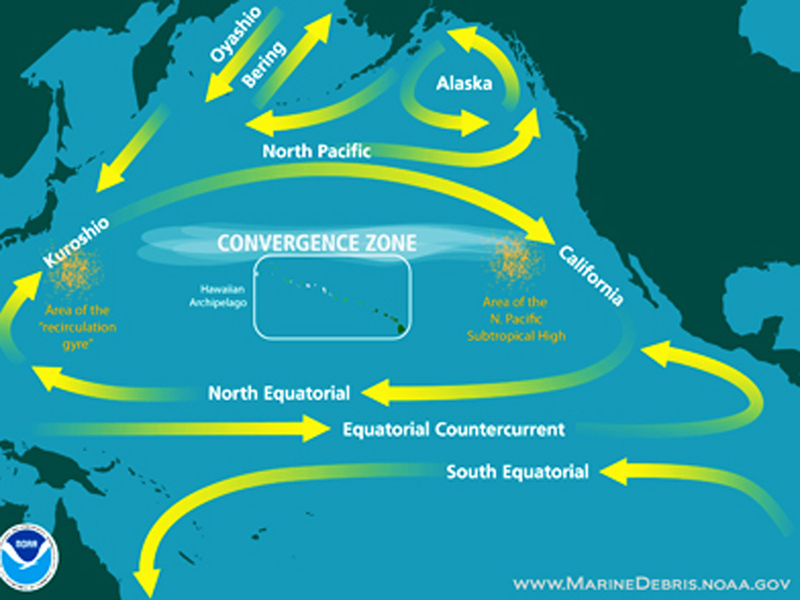 Some wind up in the Great Pacific Garbage Patch, a vortex formed by ocean and wind currents. The garbage patch cannot be seen by satellite. Most of the plastic pieces are confetti-sized flecks spread across thousands of miles (kilometers) of ocean and are hard to see with the naked eye. A similar plastic trash patch was recently discovered in the Atlantic between Bermuda and Portugal's Azores islands.